Up nice and early in the hope that I might get a sunrise, but once there was enough illumination to see my surroundings, it was clear that this was not going to happen. The landscape was shrouded in a thick soup of grey fog, under a chunky stew of sombre cloud, topped off with a beefy brew of gloomy light. All this poor weather was making me hungry, but instead of filling my bemoaning belly, I decided to head up onto the moors to see if there were any atmospheric shots in the offing, while the fog was still so dense. Stopping in one of the little car parks that dot the moors, I got out and with no particular direction in mind, I took a stroll amongst the dew covered heather and ferns hoping something would catch my eye. The colours were vibrant thanks to the overcast conditions. 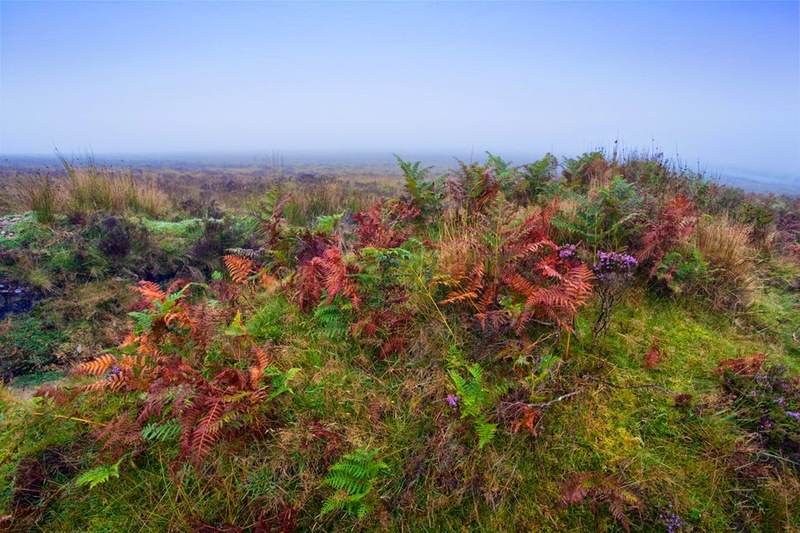 As usual, if you look, you will find, and it wasn’t long before I was snapping away in the cold, hushed surroundings, trying to make the most of the brightly coloured vegetation as it sat resplendent against the murky atmosphere. The mist was still pretty thick at this point. But the atmosphere was incredibly peaceful and quiet. After a while the light started to improve and patches of sunlight were beginning to peep through the low clouds, enabling me to get some more expansive landscape views. It was still early, and there was very little traffic using the winding roads that traverse the high moorland, so I could wander freely along the carriageway. The overcast conditions started to break slightly after an hour or so. In fact, the only ones I had to share it with were the local sheep, who seem to use the road as a place to sleep at night. Usually during the day there are a few knocking about on the edges of the roads, listlessly chewing away with that blank stare of theirs, which means care should be taken when behind the wheel. campsite it was back to dense grey fog. But first thing in the morning they all seem to be occupying the asphalt, and progress is only made by slowly approaching them and hoping they have the good sense not to trifle with a car, which most of them do, but by no means all. Plus they seem to favour the road as their preferred powder room, and the carriageway was liberally strewn with their nightly leavings. Dirty beasts. After getting a few shots, it was time to head back to camp, stuff my car full of camping gear and head off. I wanted to get a few images back up on the moor before the sun got too bright, or disappeared completely, as either was possible. Thankfully my drive over the moors were bathed in sunlight.